...A PUBLIC ART COMMISSION! However after many months, we could not come to a contractual agreement mainly regarding copyright and construction (biggies in the mosaic art world). Meanwhile another public opportunity sprouted... and is still on hold (as they tend to do).... I am grateful for the opportunities, but spent some time frustrated about things beyond my control. I have a better grip on it now. Looking forward to catching up on some of the local residencies this upcoming school year! In the summer of 2015 I started the process of building a studio on to the house, as many of you read on FB. That process was longer and more tedious than expected, but by November, I was able to "move in"! It is infinitely better than my dungeon room inside the house, and my spider laden garage. 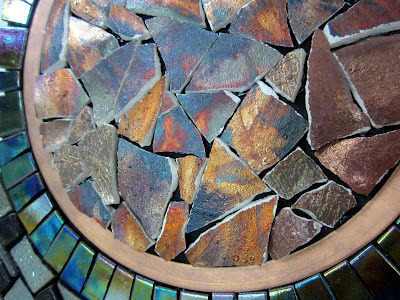 Since then, I have been working on a new mosaic series of gallery work, been juried into several shows, and joined several community shows, and have been constructing a mosaic sculpture for a neighborhood in Salisbury (which will be installed early Aug). Sunday begins a new adventure.... more about that next week, promise.